“The previous government oversaw changes to apprenticeship policy and cuts in employer incentives that led to huge drops in the numbers of young people starting an apprenticeship.” – Australian Chamber of Commerce and Industry, media release, October 30. The Australian Chamber of Commerce and Industry has blamed the former government for a fall in the number of young people starting an apprenticeship. The decline has been labelled in The Australian as “the disappearing trainee” – a legacy of the Labor government linked to its decision to remove employer incentives. So are Australian apprentices really disappearing? There are two types of Australian apprentices. There are those who are learning the skills listed on the National Skills Needs List – like plumbers, hairdressers and electricians – and those who aren’t. The National Skills Needs List identifies the areas that are experiencing a national skills shortage. In October 2012, the Labor government reduced the employer incentives for part-time apprentices in non-skills shortage areas. But in August 2013, Labor removed the financial incentives to non-skills shortage apprenticeships entirely. This meant there were no longer incentives for apprenticeships in retail positions in food, clothing, information technology, horticulture, printing and for dental assistants. The thinking was that these areas did not need incentives for formal apprenticeships because, by and large, on the job training would suffice. The last two years have seen a drop overall in the number of new apprenticeships. But there has been barely any drop in the traditional trade apprenticeships with skill shortages. Using figures from the National Centre for Vocational Education and Research (NCVER), in the first nine months of 2012, there was a reduction in apprenticeships overall from 263,500 to 185,300 in the same period in 2013. As the first chart below shows, the number of new apprentices dropped by 30% this year when combining the total trade and non-trade apprenticeship figures. But the drop in “trade” apprentices was not nearly as severe. In fact, it was not severe at all when comparing 2012 to 2013. The trade apprentice commencement figures show a decline of a mere 1,900 commencements in the first three quarters of 2013 (71,700), when compared with the first three quarters of 2012 (73,600). 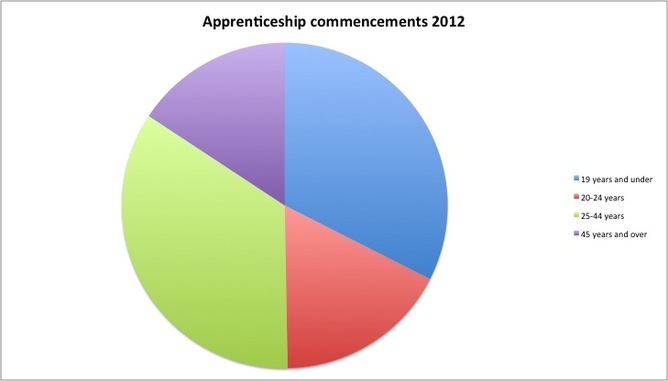 In 2012, the total number of traditional trade apprentice commencements was 95,600. If the December quarter for this year sees another 23,900 traditional trade apprentice commencements, which is feasible, then there will be no downturn in traditional trades. This graph also shows that the number of apprentices from non-traditional trades – the ones Labor’s changes targeted – were on the decline before the first policy shift in 2012. This tells us that the government’s actions are unlikely to be the sole reason behind the decline in these types of apprenticeships. The focus on young people being associated with apprenticeships is a recurring but inaccurate view. The majority of all apprentices (50.27%) were aged 25 years or older in 2012 according to NCVER data. A little under half are classified as youth. The 2013 figures are not available but this trend is not unusual. So young school leavers were not particularly affected by the overall downturn in apprenticeships, any more than those over 25 were. Under Labor’s watch, there has been a drop in apprentice commencements but only for non-trade apprenticeships. These were on the decline before the employer incentives were withdrawn by Labor, while traditional trade apprentice commencements have remained steady. This article is helpful and a fair examination of the evidence. The report of the Expert Panel into Apprenticeships for the 21st Century provides the research behind the policy shift discussed. – John Buchanan. This article by Alan Montague, RMIT University was originally published at The Conversation. T here was speculation after the announcement of Tony Abbott’s ministry early in the week as to who would be handling VET matters within the education portfolio. The Scan initially suggested Sussan Ley but pulled that down when the now prime minister said that, while the division of responsibilities inside the education portfolio was yet to be settled, higher education and schools would largely remain the responsibility of Christopher Pyne, Sussan Ley would continue to look after early childhood education and childcare and Scott Ryan “quite possibly” would have responsibility for curriculum. One commentator predicted Ley would take the lead on key tertiary reform issues including regulation, the demand-driven system, loans schemes and “the dog’s breakfast that is apprenticeships”. Well, yes, there you go: the VET side of the tertiary sector has actually landed in the lap of former and once more industry minister Ian McFarlane, along with science and research. It’s a curious decision to separate the tertiary sector in that way, although not without precedent: VET was located in the business portfolio in Victoria in 2006 but reunited with education by the incoming Baillieu government in 2010. As John Ross suggests in The Australian, the decision has “dug a trench across educational policy”. 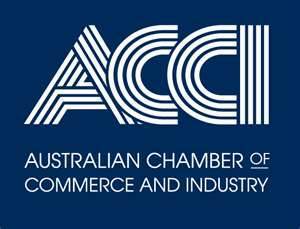 The Australian Chamber of Commerce and Industry’s education director Jenny Lambert said said that, while there are advantages in aligning training with industry policy, the new government had overlooked ACCI’s lobbying for a “whole of education and training” approach to improve pathways from schools to vocational and higher education colleges. Lambert said the decision would separate training at colleges and workplaces from preparatory vocational training at schools and university-level training for doctors, lawyers and architects. The training sector is deeply linked to jobs and the economy. So, presumably the rest of education is somehow disconnected from jobs and the economy? This signals that the purpose of vocational education is to provide specific skills that employers want. It’s a very short-term view – we need to develop a broadly educated workforce that supports occupational progression. It does seem a rather narrow, utilitarian view of the nature of VET. Something that governments and their advisers seem to increasingly overlook is that about 80% of VET activity is in areas other than vocational training and is in more general education, which itself can serves as a pathway to other training and education (which is the logic of the Australian Qualifications Framework). It also ignores the evolution of many TAFE institutes and some of the bigger private providers as integrated training and education providers, as witnessed by the blossoming polytechnic movement. Finally, it connotes the official end of the “seamless tertiary sector” envisaged in the early, optimistic days of tertiary reform, inspired by the Bradley Report, although that may have sufficient momentum to occur organically (again, the polytechnic movement) – unless, of course, the government takes a dim of such developments and seeks to stymie them through, for example, funding restrictions. An Abbott government would make it easier for foreign students to obtain post-study work rights in Australia as part of a Coalition push to repair the lucrative education export industry. Opposition education spokesman Christopher Pyne says the Coalition ”cannot promise to reverse the $2.8 billion of cuts to higher education”. However he vowed to increase revenue to universities within 100 days of being elected by ”rebuilding” the international education market, which he said had shrunk under Labor from $19.8 billion in 2008 to $14.5 billion today (although the decline has been concentrated in the VET sector)….. [ READ MORE ] …..
Australia’s education peak bodies has urged all political parties to get behind measures to restore global competitiveness and innovation to Australia’s international education sector. They warn that Australia is losing ground to international competitors whose governments place a higher value on international education than Australia does. Expensive and inflexible student visas, a complex and stifling regulatory system and a reluctance by governments to aggressively promote Australian education abroad are combining to turn potential students away from Australia and into the “welcoming arms of Canada, New Zealand, the UK and the USA”….. [ READ MORE ] ….. The academic standard of a school is a critical factor in whether disadvantaged students complete Year 12 and significantly raises their chances of studying at university by as much as five times. 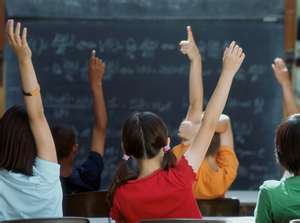 A report by the National Centre for Vocational Education Research has found that pupils from low socio-economic backgrounds who are weak students and attend a school of low academic quality have a 30% of completing Year 12, and a 10%chance of studying at university. But attending a school of high academic standards gave them an 80 per cent chance of finishing school, and a 50 per cent chance of going to university….. [ READ MORE ] …..
An analysis by the Victorian Tertiary Admissions Centre (VTAC) has found that a proposal from Australia’s Group of Eight (G08) universities to limit university entry to students with an ATAR of 60 or more would have cut the number of university offers to school-leavers this year by 23% or 13,200 offers. The proposal would halt the surge in undergraduate enrolments, which have grown by 190,000, since Labor came to office in 2007 and save the Commonwealth budget about $750m over 4 years. The Go8 proposes this could be used to offset savings of over $2b imposed earlier this year….. [ READ MORE ] ….. The outgoing head of the National Centre for Vocational Education and Research (NCVER), Dr Tom Karmel, has lamented the slow progress on implementing a ‘seamless’ tertiary education sector, as proposed by the Bradley Review. Karmel says the promised integration between higher education and vocational education is “more distant now than ever”, while overstated differences between the sectors are producing dysfunctional outcomes. Other commentators agree that progress with the integration agenda is not only a long way off but suggest that higher education would become an even more dominant partner if there were to be “forced marriage” with vocational education….. [ READ MORE ] …..
A meeting of employer organisations, peak provider groups (including TDA and ACPET) and Industry Skills Councils has called on all political parties to respond, as a matter of urgency, to the dramatic drop in apprenticeship commencements. According to the group, employers are losing confidence in the apprenticeship system, not because of a lack of commitment to a long-standing model of training delivered in a work context, but because they cannot rely on consistency in the approach by both Federal and State Governments…… [ READ MORE ] …..
16 August 2013 | With five universities in the world top 100 and 19 in the top 500, Australia has one of the strongest higher education systems internationally  in spite of scarce research dollars and small population and economic scale. 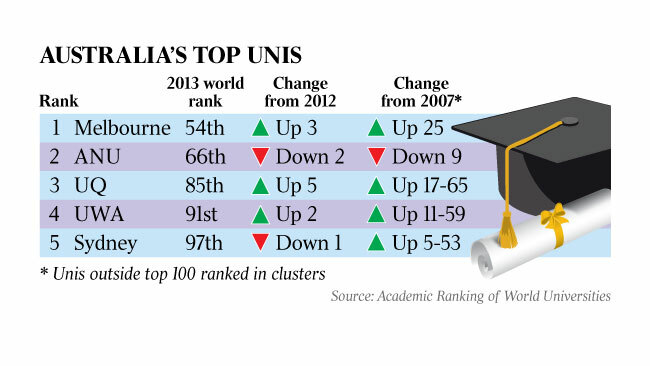 The University of Melbourne again took the title of Australia’s “best” university at 54th. It was accompanied in the top 100 by the Australian National University (66th), University of Queensland (85th), University of Western Australia (91st) and Sydney (97th)…. [ READ MORE ] ….. In an opinion piece published in the Australian Financial Review, Swinburne University’s head of Corporate and Government Affairs, Andrew Dempster, says that uncapped funding for higher education is fairer and more efficient. 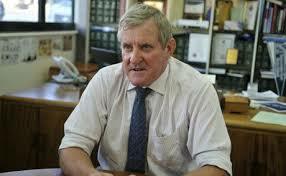 He also says it’s consistent with Coalition policy – and Labor , of course, introduced it. There is a degree of resignation in higher education circles that the system of funding undergraduate university places according to student demand may be on its last legs. This is not new. Hand-wringing about the sustainability of the so-called demand-driven system has been fashionable for some time. 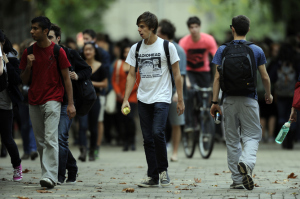 There is heightened scepticism of the demand-driven system among Australia’s sandstone universities, which have an unfortunate tendency to look down their nose at those institutions that take students with ATAR [Australian Tertiary Admission Rank] scores of 70 and below, as if those that do are “lowering the standards” for everyone else. This is despite the fact that many establishment universities would not know what a student with an ATAR of 70 looks like, let alone how university teaching might be configured to assist these students to succeed. It is also conventional wisdom that, because the demand-driven system is a Labor creation, it will inevitably be for the chop under any Coalition government that follows. While budget pressures are real, it does the Coalition no credit to assume the demand-driven system will be dispatched to history if it forms government this year. Indeed, there are many reasons why it may survive and even prosper. 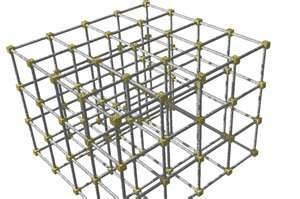 News, views policies and links on the 2013 Federal election. The Australian Financial Review’s incomparable David Rowe captures the general reaction to the Coalition’s paid maternity leave scheme, which has been described as bad policy, inequitable and extravagant. The University of Melbourne presents the 2013 Faculty of Arts Winter Series of masterclasses designed to expand horizons, enliven the mind and enrich the soul this Melbourne winter. The masterclasses are scheduled over a series of weekends in winter and into spring, featuring the university’s most celebrated teachers and public intellectuals. ACPET’s national conference is the largest gathering of private and not-for-profit educators and trainers in Australia and provides an opportunity for networking and professional development. A meeting of employer organisations, peak provider groups (including TDA and ACPET) and Industry Skills Councils has called on all political parties to respond, as a matter of urgency, to the dramatic drop in apprenticeship commencements. They say the future of skills development and productivity growth in Australia hangs in the balance, waiting for policy clarity and clear commitment from all sides of politics. According to the group, employers are losing confidence in the apprenticeship system, not because of a lack of commitment to a long-standing model of training delivered in a work context, but because they cannot rely on consistency in the approach by both Federal and State Governments. A series of ad hoc changes to policy, training funding and financial incentives which have cut support of apprenticeships at the Federal and State level have had a dramatic and destabilising impact on apprenticeship commencements, which are now at their lowest level since 1999. Government support for apprenticeships is narrowing such that major growth areas of the economy, including the service sector industries of retail, transport, finance and hospitality are bearing the brunt of the changes, but with all occupations in apprenticeships detrimentally affected. The Australian Chamber of Commerce and Industry is losing faith that national skills reform will deliver a simpler, higher quality system for employers and students after NSW became the latest state to announce its plans. The NSW government outlined a cautious approach to deregulating the vocational education and training sector, insisting the state had learned from the Victorian experience and consulted heavily with industry. NSW Education Minister Adrian Piccoli said government-subsidised training would only be available in skills shortage areas and through approved private providers, allowingNSW to avoid a budget blowout similar to that which occurred in Victoria, where students flocked to personal fitness and other low-level courses that were not aligned to labour market needs. We are determined that we will not make the same mistakes they have made there. But ACCI employment, education and training director Jenny Lambert says the jigsaw-like changes occurring across the states are confusing for employers and students, and there is no sign as yet of a nationally consistent training system, which was the intention of the $1.75 billion National Partnership Agreement on Skills Reform, signed in April and to be delivered by 2014. Lambert also warned against going further down the route of student demand-driven, uncapped systems for post-school education. We certainly believe an uncapped, student demand-driven system has got to be significantly restricted. It needs to be capped and directed to where the skills needs are. David Collins, the general manager of state training services in the NSW Department of Education and Communities, said the government would work with industry to make sure that subsidised courses on offer were in line with skills shortages. We will be working with industry to establish a skills list which will really define the scope of the qualifications that will be funded under the entitlement.